Hello and welcome to my ham radio web page. I have been an amateur radio operator since 1967, and continue to enjoy this fascinating hobby to this very day! I especially enjoy ham radio contesting. I hope we can work each other on the air soon! The picture to the left is my rotating 140 foot tower for my main 10 and 15 meter antennas. 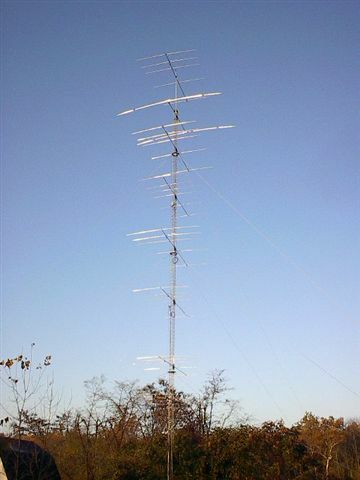 There is also a 2 element 40 meter beam that is my multiplier antenna. This picture shows the installation in Indiana, where I lived between 1993 and 2007. The same tower and antennas are now up in my Montana QTH, but there are so many trees that the tower and antennas are easier to see in this older picture.